The knee is a complex joint consisting of the intersection of several bones bound together by tendons, ligaments and menisci and surrounded by soft tissue and muscles. Injury to the knee can result in sudden, sharp pain, swelling and difficulty walking. Pain may radiate to surrounding areas such as the thighs, calves and hips. Treatment varies depending on the cause of the pain. If pain begins gradually with some soreness and aching when walking up or downhill, you may be suffering from an overuse injury called patellofemoral pain syndrome, or chondromalacia patella. Pain is usually localized under the kneecap and worsens when walking an incline or when you wear high heels. Pain often occurs when the kneecap, called the patella, rubs against the femoral bone. Pain usually subsides when you stop the activity but may flare up again unless treated. Strengthening the quadriceps and hamstrings can help stabilize the patella and prevent it from rubbing during activity. The iliotibial band, a thick strand of fascia, stretches from the outside of your knee across your hip joint. Repetitive flexing and extending the knee, as when you are walking or running, can cause the band to rub against the bony portion of your femur. This friction can cause irritation and inflammation, causing excruciating pain in the outside of your knees. This pain may radiate from the knees up to the thigh or down to the shins. ITBS can be challenging to treat and may require physical therapy. Attempting to move your leg while your foot is planted may cause the patella to slip out of place, usually toward the outside of the leg. A dislocated knee often causes sharp pain, swelling, deformity and, often, an inability to bear weight. While not always debilitating, a dislocation often requires physical therapy and in some cases, surgery. The three main ligaments of the knee -- the ACL, MCL and PCL -- connect bones to bones and help control motion. While simply walking uphill does not usually damage ligaments, any sudden, jarring movements can tear the ligaments in the knee joint. If you experience sharp pain in the knee that radiates to the shin or thigh, you may have damaged one or more of your ligaments. Treatment usually involves resting, icing and elevating the joint along with taking anti-inflammatory medication to reduce pain and swelling. In extreme cases, knee pain may be caused by a fracture of the kneecap. A fracture can result from an overt injury or repeated stress. In most cases, pain is acute and debilitating and must be treated by a health care professional. 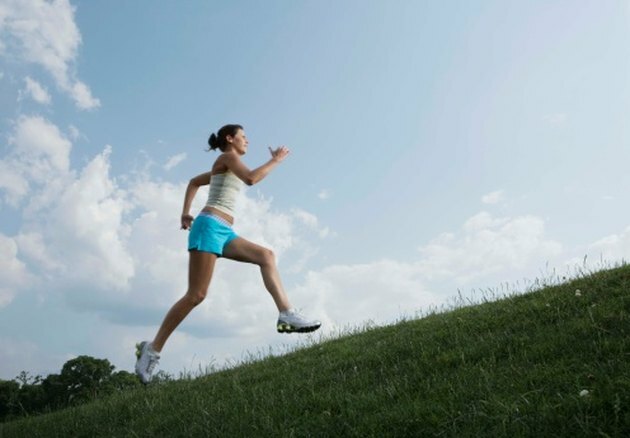 Pain in the knees that occurs when ascending an incline with radiating pain to the thigh and lower leg can be caused by a number of injuries or conditions. Check with your doctor for a conclusive diagnosis before attempting to treat recurring or severe pain. What Are the Causes of Front Knee Pain When Walking Up Steps?